For journalist and writer Tom Brakow’s Greatest Generation no artist captured the joys and struggles of the American people more earnestly than Saturday Evening Post illustrator Norman Rockwell. 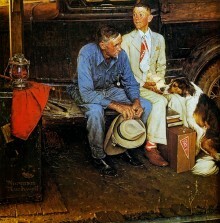 This lecture will review Rockwell’s great achievement of chronicling the American Dream – and its ever changing moods – from the late 1910’s through the late 1960’s. JAMES ROBINSON earned his Bachelor of Fine Arts degree from Columbia College, and studied Italian Renaissance and Baroque Art through Loyola University’s Rome Center in Rome, Italy to gain a firsthand understanding of art history. He spent 9 years in the field of children’s text and trade books, where he worked in production, design, and illustration. Wishing to expand his knowledge of drawing and painting techniques further, Jim moved to Minnesota to study at Atelier LeSueur and Atelier Lack, schools which emphasized the disciplines of nineteenth century academic and impressionist painting. Following his graduation, Jim became an instructor in the full time program at The Atelier, teaching drawing, painting, and composition to adults pursuing careers in the fine arts. He has also taught workshops on color theory and Renaissance oil painting techniques throughout Minnesota. In addition to teaching, Jim has also written and lectured on artists and the importance of art history in professional artists’ lives. His articles have appeared in international publications. In 1993 Jim founded The Art Academy in St Paul because he believes that everyone has a natural ability to draw and paint exceptionally well. This year the school celebrates its 25 Anniversary.